Conrad Maldives also known as Rangali Island, located in South Ari Atoll - one of the best atoll for marine life in the Maldives. It is known for having some of the best diving sites, as well as home to some Manta Rays and Whale sharks. I have been to this property twice, once in 2011 and again recently in 2017. One of the most unforgettable experience for me back in 2011 was my first encounter with wild Manta Rays, they would come to the resort at night to feed. I couldn't believe my eyes when I saw them the very first time, and they came 3 consecutive nights during my stay. Conrad Maldives has expanded over the years, now they offers eight restaurants and four bars, a business centre, three boutiques, two Spas, a Fitness Center, Dive Center, Watersports Center and an open-air cinema, spread accross two islands. Upon arriving Male international airport, guests will greeted and taken to the Conrad Lounge to wait for seaplane departure. It takes approximately 30 minutes by seaplane from Male to arrive this beautiful island resort. Seaplane docks in the middle of a bridge that connects two islands. 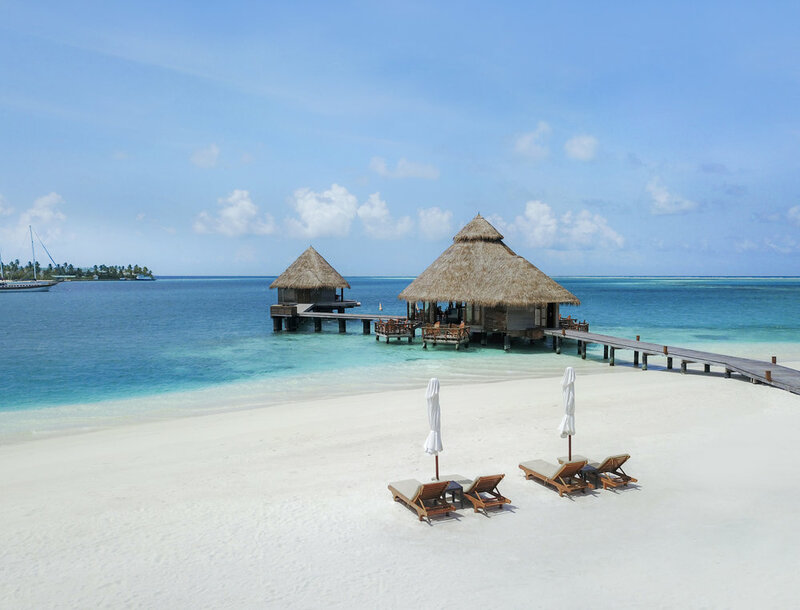 The resort features 150 villas, from romantic water villa on the adults-only Rangali Island, refurbished beach villa on the family friendly Rangalifinolhu Island, or a stunning over-water villa at The Spa Retreat - there are a total of 10 different categories room choices to choose from. Most of the room types have individual plunge pool for guests to enjoy total privacy at their comfort. One of my favorite rooms here at Conrad Maldives is their Sunset Water Villa, the largest overwater villa at Conrad Maldives with an infinity pool that faces the beautiful lagoon. It is located towards the edge of the island with its own private beach and sandbar, giving guests the ultimate Maldives experience! For those of you who has been following me, sandbar and sandbank are some of my favorite Maldives features. Conrad Maldives is known for having a lot of restaurant options as well as it is famous for building the world's very first all glass undersea restaurant - Ithaa. With over 12 dining option to choose from, I have to say I am very impressed by the diversity of cuisines that Conrad Maldives offers, as a foodie, I really had an amazing experience! Atoll Market, serves international cuisine from 8 specialist kitchens, the only buffet style restaurant that serves breakfast and dinner. Ithaa Undersea Restaurant, world's first underwater restaurant, serves contemporary cuisine. I highly recommend visiting the Ithaa Undersea Restaurant for lunch, cocktail, or dinner. It is definitely one of those once in a lifetime experiences that I think most should take advantage of when visiting such a beautiful country. Koko Grill Restaurant, al fresco dining with 9 course menu serves Japanese food. It was a great experience to watch your food being prepared in front of you under the stars. Mandhoo Spa Restaurant, an open air overwater restaurant, also one of my favorite place to dine on the island. I really love the concept behind the menu, it is designed around the 5 elements of earth - air, earth, fire, water, and plant. Each dish is specially prepared using organic produce and species grown on the island, and fresh ingredients around the world. Sunset Grill, also an overwater restaurant that serves freshly grilled seafood and meat. It's definitely one of the best spot to view sunset on the island, and guests can also keep an eye out for sting rays and Manta rays. The Wine Cellar, Maldives' first underground wine cellar, serves a different menu every time. The restaurant can only accommodate up to 12 guests each meal, and it's a 5 course set menu with up to 8 different wine pairing. Ufaa by Jereme Leung, a restaurant named after a celebrity chef from Singapore, serves innovative Chinese cuisine. The word Ufaa means "Happiness" in Maldivian, which reflects on the design of the restaurant - to give a relaxing island lifestyle ambiance. Vilu Restaurant and Bar, located on the adult only Rangali Island, serves both buffet and a la carte breakfast, as well a fine dining dinner. The Vilu Bar is also a fantastic location for guests to enjoy drinks and snacks while watching sunset. Rangali Bar, located in the heart of the Resort by the main pool, serves a la carte lunch and snacks. The Quiet Zone, an open air tented lounge for age 12 and above, the perfect spot to lay on comfortable day beds and relax. The Cheese and Wine Bar, home to 101 of the world's best cheeses selected by the resort's Maître de Fromage, hosts informal wine and cheese tasting as well as regular fondue and tapas. Lobster and Champagne on the beach, definitely one of my favorite beach dining experience at Conrad. There are lots of fresh seafood as well as meat selections for beach bbq, and guests can enjoy a romantic beach bbq with live music and beautiful sunset.